At Lucky 6 Marketing we don’t believe luck happens by chance. We believe your luck can be improved with well informed decisions, doing the right thing at the right time and being brave enough to go for it. 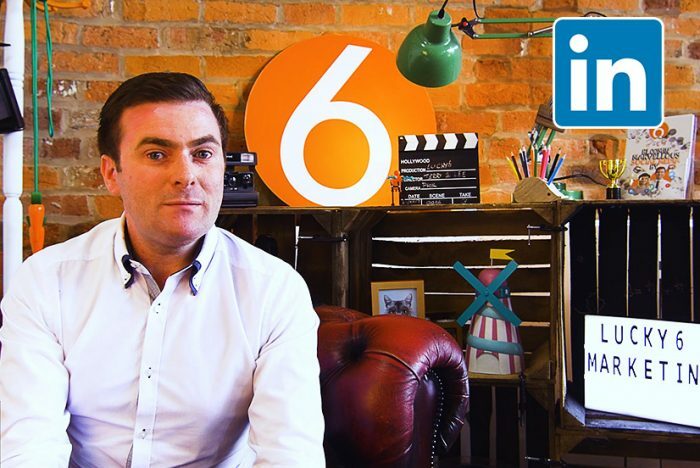 With this in mind we have put together the following 6 steps to significantly improve your luck on LinkedIn. There is a human condition called Pareidolia which we all suffer from. This condition means we unconsciously see faces within everyday objects. Our brains are hardwired to do this. Use the human condition to your advantage and make sure you have a high resolution photo of your face. When uploading to LinkedIn be sure to crop this photo around the face rather than the shoulders. Cropping closer makes your face very easy to see and recognise. See our past blog #QuickTip: Profile Pictures. When did you last upload a new profile picture to LinkedIn? Recent statistics state 70% of LinkedIn users read updates on the timeline but do not interact. These are the silent majority and your main audience. Do not be put off by lack of engagement on LinkedIn. If you post consistent and useful content it will be seen and there will be value to doing this. Just be patient. 3. Build a personal community or connect with everyone? There are two distinct ways of managing your LinkedIn profile. You can LinkedIn with all who have value, such as customers within your target market. Alternatively you can LinkedIn with those you have personally met. Both methods have a different type of value. Connecting with all who have value is a great way to potentially drive sales; but do be careful not to spam and potentially damage your reputation. On the other hand you may prefer to keep your LinkedIn as a private network. This makes your content more exclusive, targeted and allows better management of your personal PR. Personally, I will only connect with people I have met face to face. Twitter is my platform of choice for connecting with everyone. 4. A job title or describe what you do? What sounds more inspirational to you? Managing Director or Success Facilitator? The latter is the job title I saw on one of our client’s LinkedIn profile. It’s inspirational, descriptive and stands out from all the others. You profile job title is an amazing opportunity to tell everyone on the internet what you do. You have two choices. You can use a more traditional job title so it’s very easy for LinkedIn users to understand what you do or you can use a more modern descriptive title. The choice is yours. What’s the best job title you have ever seen? LinkedIn is quickly becoming a blogging website. This is an amazing resource! Firstly it’s a great learning portal and secondly it is a hugely powerful PR tool. Share your sector tips and trick. Demonstrate to your connections how much of an expert you really are. Blogging is a skill in itself but if you are going to take the time to write a blog you now have two uses for it. Your own blog platform/website and LinkedIn. Since LinkedIn was first setup recommendations have been its lifeblood. They are also the backbone of good PR. Don’t be shy ask people to recommend you on your LinkedIn. A good recommendation will show two things to your LinkedIn community. Firstly it demonstrates that you provide a good service or product. Secondly it shows that your service or product is so good that your connections are even willing to take time out and write a recommendation for you. If they are not willing to take the time to recommend you then they will most likely endorse your skill as many do. This is why a good recommendation carries a lot of value. Hope these tips have been of help to you. Please feel free to add your own steps to improving luck on LinkedIn in the comments section below. This will almost certainly be very handy for a few of one’s employment. I intend to put this to good use.